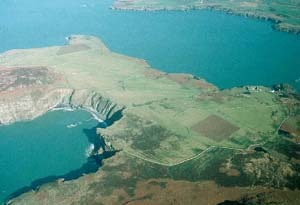 An area of modern Pembrokeshire occupying the northeastern half of Ramsey Island, off the western tip of St David's Head. Administratively, the island formed part of the medieval Cantref Pebidiog or 'Dewisland', which was held directly by the Bishops of St David's, having represented the core of the bishopric from 1082 when it was granted (or confirmed) by Rhys ap Tewdwr, king of pre-Conquest Dyfed, to Bishop Sulien. Historically, the island formed part of the parish of St David's, and contained two medieval chapel sites which may have early medieval origins, one of which - dedicated to St Tyfannog - lies in this character area. It is associated with a holy well site, a cemetery and an inscribed stone which may commemorate a 9th century bishop. It has been suggested that the relationship between the island and the monastery at St David's may be analogous to that between Llancarfan and Flatholm in the Bristol Channel, as an island retreat for the monastic community. The island is laden with legends from its past inhabitants, many of them supernatural and involving the fairies Y Tylwyth Teg and Plant Rhys Dwfn; others tell of the sound of bells beneath the sea. During the post Anglo-Norman conquest period, Ramsey Island, and particularly the well, was an important pilgrimage site. From 1115, when Bernard was appointed Bishop of St David's, Anglo-Norman systems of feudal government and ecclesiastical administration were introduced into Pebidiog, which was conterminous with the later Hundred of Dewsland created in 1536. However, adapted Welsh tenurial systems appear to have persisted. 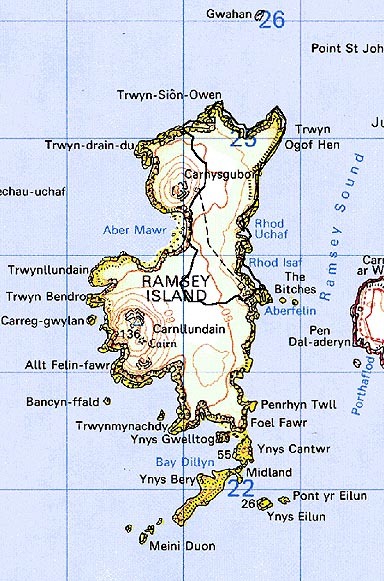 Ramsey became a fairly productive part of the Bishop's lands, and an Inquisition Post Mortem of 1293 indicates that the island was fertile and that a wide range of mixed farming was practised. Beef cattle, sheep and goats, and also wheat, oats and barley are recorded. A more detailed account in the Black Book of St David's of 1326, records that the bishop had 2 carucates of land on the island, containing 100 acres, on which could be kept 10 horses, 100 head of 'great cattle' and 300 sheep. 100 loads of rushes and heath were taken per annum, and 500 rabbits 'for cooking' worth 33s 4d. The island was also exploited for gull, guillemot and puffin eggs. The field pattern in this character area was in place by the early 19th-century and appears to be more recent than the relict boundaries in the Carn Llundain - Caer Ysgubor character area, which may be bronze age in origin. Originally this bronze age system may have extended over this half of the island, and some of the extant boundaries here may perpetuate the line of earlier boundaries. A farmhouse on the island, adjacent to a corn mill and lime-kiln, was occupied by one William Browne in 1543-4 but the present house was constructed in c.1800, the old building being in ruins when visited by Fenton in c.1811. Farming continued well into the 20th century, and in the 1900s was undertaken by the Arnold brothers who grew barley, potatoes, turnips and peas, rearing sheep and some pigs and horses. A corn mill and lime-kiln were both then still operational. The island remained an ecclesiastical holding until sold into private hands in 1905. It is now owned and managed by the RSPB. Ramsey historic landscape character area consists of that part of Ramsey Island which contains an in-use field system, essentially the northeast corner of the island. This is the most sheltered part of the island, and comprises a shelving tract of land that slopes down from 55m in the west to 30m on the eastern side where it ends in high sea cliffs. Dry-stone walls and stone-faced banks divide the area up into medium- to large-sized irregular fields. Boundaries are generally in a good state of repair. Land-use is predominantly pasture. It is a treeless landscape. A stone-built 19th century farmhouse in the vernacular style with an extensive range of 19th century stone-built farm buildings is situated on the cliff tops above a landing place/quay. The farmhouse is Grade II listed. The buildings are roofed in slate and asbestos sheet. Recorded archaeology comprises a mesolithic-neolithic findspot, a possible bronze age standing stone site, the medieval chapelry with a St Tyfannog dedication, cemetery and inscribed stone, and the mill, quay and lime-kiln sites. Ramsey is a distinct and well defined historic landscape character area. It is bounded to the north and east by the sea, and to the west and south by unenclosed moorland.